The illustrious tiger shark is a circumglobal species that is found in a wide variety of habitats in warm temperate oceans and moves into the Caribbean in the winter. Throughout the year, individuals migrate far distances. Animals in tagging studies have been recaptured 3,430 kilometers from the tagging site. Tiger sharks are known to be opportunistic feeders and notorious for preying on sea turtles. They are the mascot of the Saba Bank and with a maximum length of over twelve feet, one of the larger species of sharks. 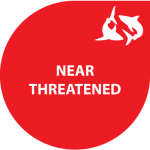 The global status of tiger shark populations was assessed by IUCN as Near Threatened, meaning it may be considered threatened with extinction in the near future. As one of the largest predators in the Caribbean Sea, their presence is imperative to regulating the abundance of fish and a healthy balance in coral reefs and seagrass beds. In historic times, the species was heavily fished upon and has shown major declines as a result of it. Gladly, it is still a relatively abundant species around the open waters of the Dutch Caribbean and is regularly sighted on the Saba Bank and in the waters in between Anguilla and Sint Maarten. The tiger shark’s Latin name, Galeocerdo cuvier, is derived from the Greek galeus, meaning a kind of shark, and cerdo, the name of a fox. Of all the requiem sharks, the tiger shark is the easiest to identify because of its many distinct characteristics. It has a short snout and tiger-like stripes on its side. It is an adaptable predator and scavenger that takes whatever prey is locally abundant, easily caught, or easily consumed. Scientists found this shark to have the most diverse diet of all shark species. Their prey includes numerous bony fish, sharks, rays, turtles, seabirds, seals, dolphins, sea snakes, cephalopods, crabs, lobsters, gastropods and even jellyfish. They are however of no threat to humans in the Caribbean since they do not tend to come close to shore. According to historical records, tiger sharks have consumed some of the weirdest objects, like rubber tires, license plates, a fur coat, a video camera, and a porcupine. Also, tiger sharks can invert their stomach in order to rid their bodies of indigestible animal parts such as feathers, bones and shells. 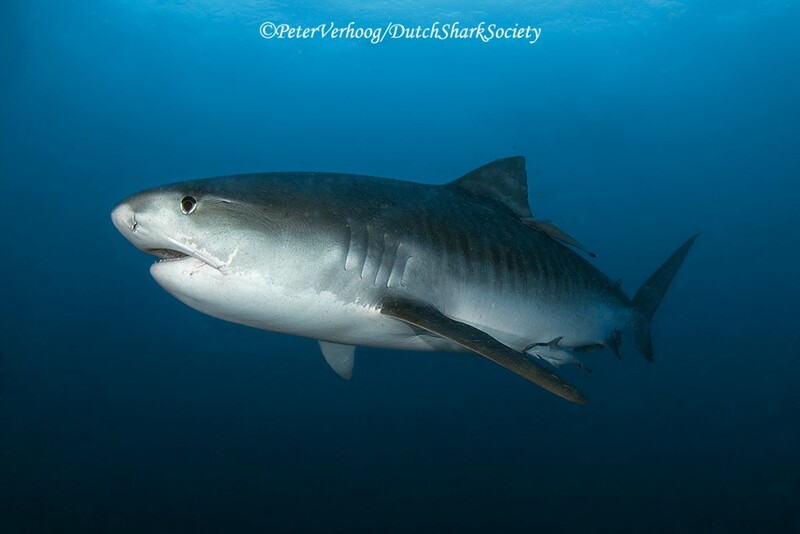 In the inshore waters of the Dutch Caribbean, people don’t observe the tiger shark very often, but during its seasonal migration, the tiger shark tends to be a common visitor on the Saba Bank in the winter months. The tiger shark is the only species of its family that is ovoviviparous, meaning they give birth to live young, after hatching the eggs internally. It gives birth in June and July, and the females do not come into very shallow water to deliver their offspring, like most sharks do, but release their young at depths of 15-100 meters. The litter sizes are relatively large, with an average of 30-35 embryos in a single litter. After 13-16 months of gestation, the female gives birth to babies between 51-90 centimeters in length. These young are very slender looking, with a flexible body and caudal fin. This makes their swimming energetically inefficient, rendering them more prone to predation at a young age. Therefore, during this first life stage, there are primarily nocturnal bottom feeders, up until they grow large enough to fend for themselves. Camera images from the bottom of the Saba Bank and in the waters surrounding Sint Maarten once showed such a juvenile tiger shark, suggesting that the Dutch Caribbean may be a favored place for the animals to spend their youth.